Who will win Copa America Centenario? SI's experts make their picks. 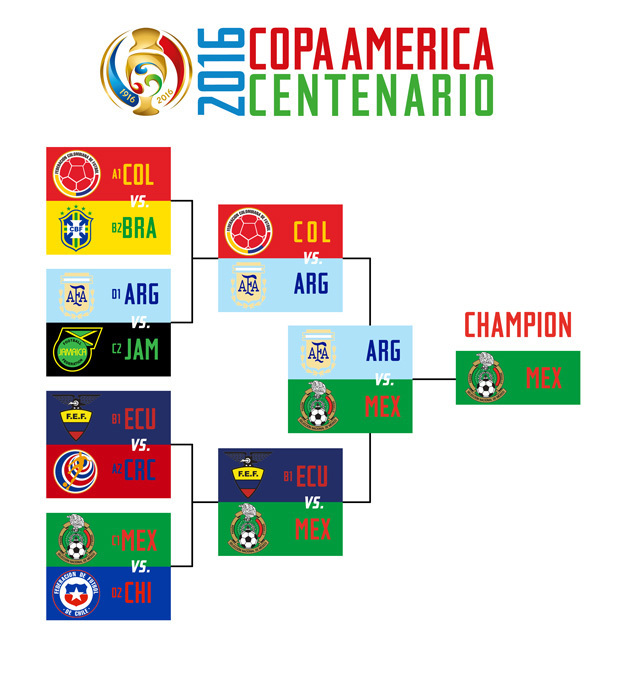 Copa America Centenario is a unique competition, one that pits South America's 10 sides against each other and some of the best CONCACAF has to offer. Despite some of the stars who won't be participating this summer–namely Neymar–and some of the nations who missed out, this is as close as it gets to a World Cup-style competition reserved for the Western Hemisphere. With that said, there can only be one winner. Argentina is out to end a trophy drought that is in its third decade. Mexico is out to make a statement against its South American foes. The U.S. is out to achieve material success under Jurgen Klinsmann for the first time since the 2013 CONCACAF Gold Cup. Brazil is out to prove it's more than just Neymar and can win without its prodigal son. Chile is out to prove that its 2015 title was more than just a product of playing at home and that it should be considered among the world's elite. Uruguay, the most successful nation in Copa America history, is out to add more silverware to the cabinet. And on down the line. AA: What’s the point of making predictions if you’re not prepared to go out on a limb? It’s tempting to pick all the chalk teams in a tournament as unbalanced as this, but Leicester City’s run has me believing in underdogs much more than normal these days. That’s part of why I picked Jamaica to advance out of Group C over Uruguay. The other reasons: Jamaica has a stout defense with in-form players that will be tough to break down, and Uruguay could be missing the world’s best pure goal-scorer in Luis Suarez. Elsewhere, I had Costa Rica going through based on the assumption that goalkeeper Keylor Navas would make at least a handful of game-saving stops. But now that he’s out…screw it, I’m going with them anyway! Mexico has performed well in past Copa Americas, and this time the team will ride partisan crowds and its own good form to arguably the most important trophy in its history. AC: There's one host of this tournament in name, but you're loco if you don't think Mexico will enjoy the same, if not a greater, crowd advantage that the USA has. In their two respective pre-competition friendlies in the United States alone, Mexico is going to outdraw the U.S. by over 100,000, and that's not a misprint. That, plus the talent on paper and the fact that Mexico is playing fantastic, disciplined and winning soccer under Juan Carlos Osorio makes El Tri my pick to win it all. It won't be easy, especially in a knockout stage that could theoretically go Chile, Brazil, Argentina in order, but Chicharito & Co. have the pieces necessary and are primed to make a statement and lift the trophy at MetLife Stadium. 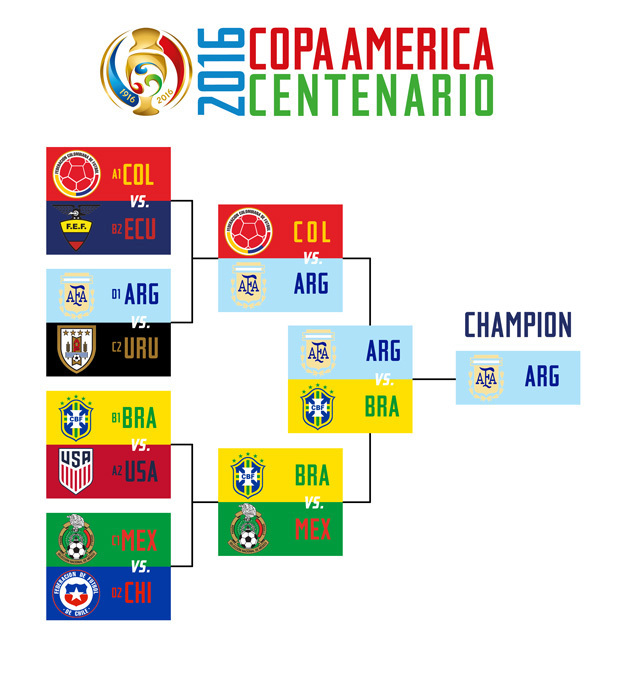 BS: This Copa América will seem redundant to some and excessive to others. The tournament logo should be a Rorschach test, because it’ll all be in the eye of the beholder. For the tournament’s sake, it’s nice that two of the most talented entrants will sense opportunity. To slog across thousands of miles and through six games in three weeks, you’ve got to really want it. And if Argentina can end it’s mystifying 23 year trophy drought, or if Mexico can make a statement to its South American rivals with its first Copa América crown (El Tri has made the semis five times and lost two finals), it’ll all be worth it. They’re both veteran teams loaded with talent, and in Lionel Messi and Chicharito Hernández, they have superstars with something to prove in a national team jersey. Argentina and Mexico will ease past less talented or motivated opponents and meet in the final at the Meadowlands. There, a desperate Messi and Javier Mascherano will inspire Argentina to a narrow victory. GW: The United States has a tendency to exceed expectations when they’re low and underachieve when they’re high. That’s one reason I think the U.S. will advance from a tricky group with Colombia, Costa Rica and Paraguay and get to the quarterfinals of the Copa América Centenario before bowing out with dignity against Brazil. In other brackets, I doubt we’ll see many surprises, which will lead to some terrific knockout-round matchups. In the end, Argentina and Mexico will be deserving participants in the final before Messi leads the Albiceleste to its first major senior trophy since 1993.